The sunny color and flavor of this healthy crock pot recipe evoke a feeling of summer, even when it's prepared in the dead of winter. Most people think of slow cookers for winter stews and roasts, but they're also great for cooking on hot summer days too. Using a slow cooker in the summer allows you to cook meat or veggies without having to turn on the stove and heat up your kitchen. Although cooked in a slow cooker, the vegetables in this recipe don't end up overly soft and mushy. While some slow cooker recipes that include vegetables recommend cooking them ahead of time to reduce the liquid in them, that's not necessary for this recipe. These vegetables will be tender, but will still retain their texture and lots of ​flavors. 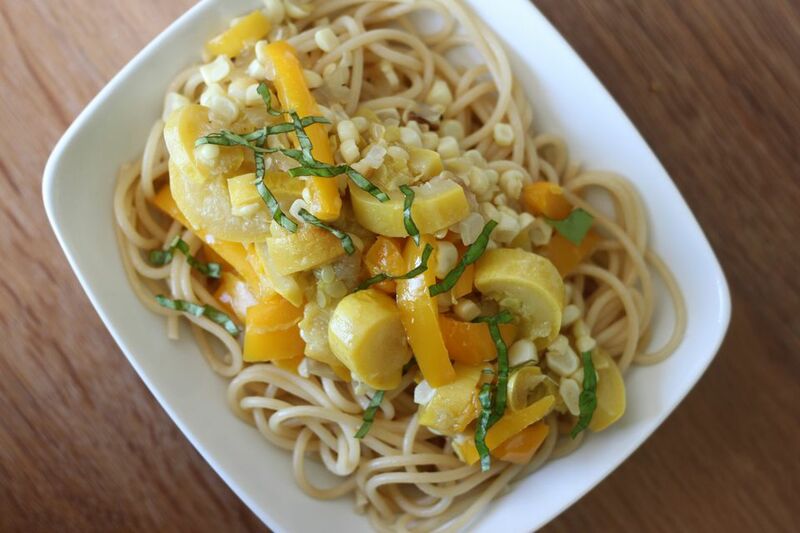 Serve this blend of corn, yellow squash, and yellow bell peppers as a side dish or as a main dish over pasta with shaved parmesan cheese. Cut the kernels off the two ears of corn, using a sharp paring knife. Remove seeds from the bell peppers and cut the peppers into thin strips. Cut the squash in half the long way, then slice into 1/2-inch wide half moons. Chop or tear the basil. Combine the corn, bell peppers, yellow squash, onion and garlic in the slow cooker with the olive oil, salt, and pepper. Stir all the ingredients well, and cook on high for 2 hours. Before serving, top with fresh basil or other herbs or spices you prefer. Serve over pasta with shaved parmesan cheese or serve as a vegetable side dish. Resist the temptation to keep checking on it before it's ready; slow cookers are best left alone while they cook. Every time you lift the lid, you increase the cooking time. Wait until cooking is complete to add spices and herbs. If they are added too early to a slow cooker dish their flavor can fade over the long cooking process. You can use dried garlic or basil, but you might need to use more to get enough flavor. To make a spicier variety of this dish, you might substitute the basil with cumin for a more Latin flavor, or use curry for a sweeter taste that evokes Indian cuisine. Good accompaniments for this dish include basmati rice, naan bread, noodles or a nice crusty Italian bread.